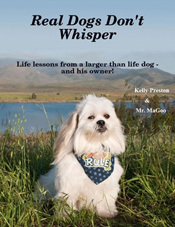 Real Dogs Don’t Whisper…Life lessons from a larger than life dog! Purchase your autographed multi award winning copy, your copy will be signed both by Kelly and Mr MaGoo; if personalized is needed as for gift giving, please let us know in the “Special Instructions” area. Join us at a book signing event.